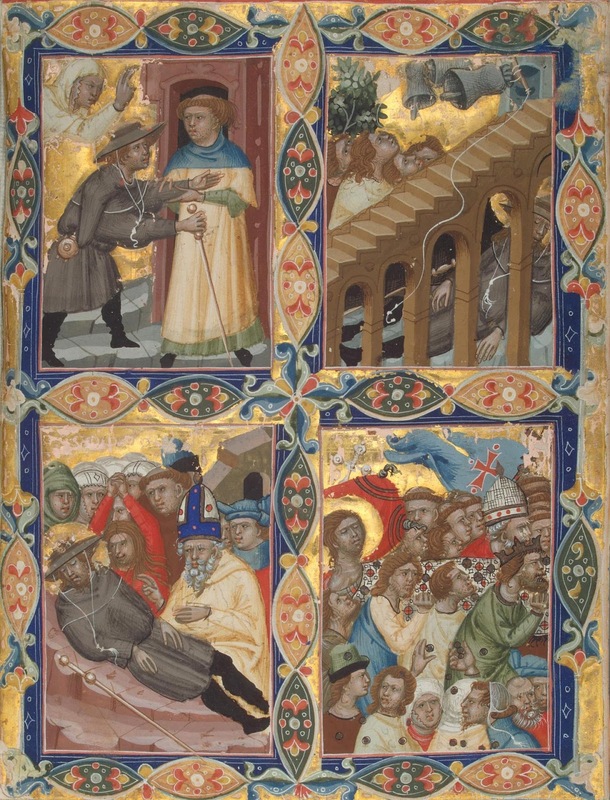 This summer, from July 7, 2011 until October 10, 2011, the Louvre is showing its Medieval and Renaissance Illuminations in an exhibition featuring seventy Italian, French, Flemish, and Germanic manuscript pages from historical, literary, or liturgical manuscripts. 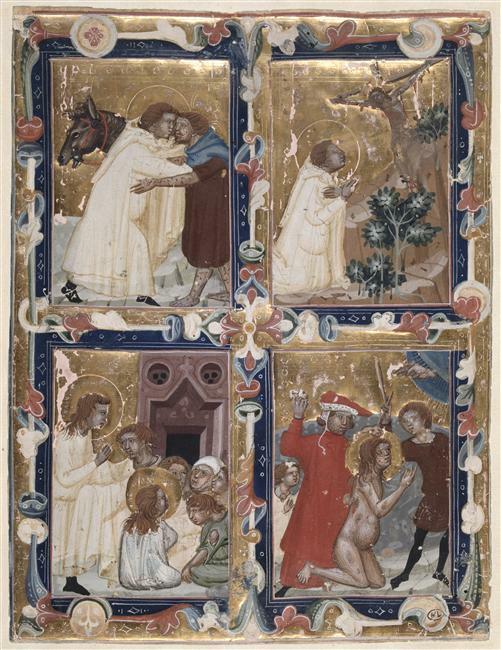 As the homepage of the exhibition states, "the Louvre’s collection of illuminations remains little known, despite the famous masterpieces it comprises. The publication of the collection’s catalogue raisonné is an opportunity to discover these exquisite works." You can read more about the exhibition at the narthex.fr website, as the Louvre itself does not provide a lot of information. I realized therefore from a recent article in the International Herald Tribune that a very important manuscript leaf with Hungarian connections, a leaf from the Hungarian Angevin Legendary is also on view (Département des Arts Graphiques, RF 29940). 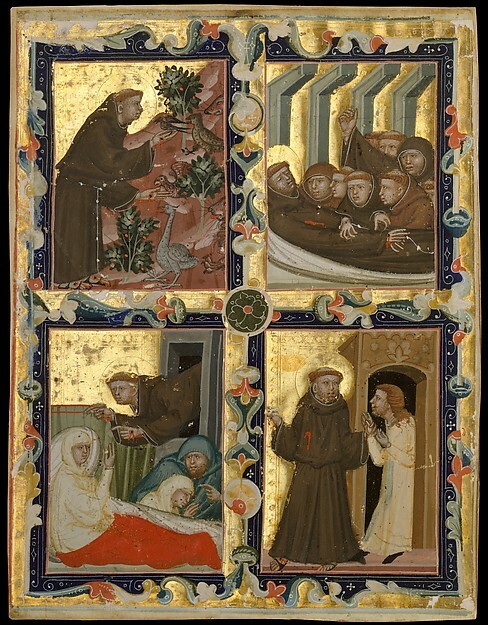 The page shows four scenes from the life of St. Francis, and can be seen here to the left (photo source: RMN). 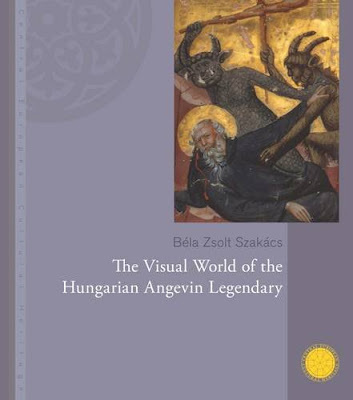 The Hungarian Angevin Legendary is the most important 14th-century Bolognese manuscript made for Hungarian royal patrons.This lavishly illustrated picture-book of the lives of the saints contains four miniatures on each of its pages, accompanied by one-line text labels. The majority of the dismantled manuscript is preserved in the Vatican Library, but there are leaves from it in a number of other collections, most notably at the Morgan Library in New York. As of today, altogether 142 leaves from the Legendary (some of them fragmentary) are known in six different collections of the world. I am providing direct links to photos and descriptions of some of these page on my website about Medieval Hungary. It is possible that some other fragments will come to light, as the original number of folios is estimated at 176. The 549 surviving little pictures contain parts from the legends of altogether sixty-three saints, plus from the life of Christ and the Virgin Mary. 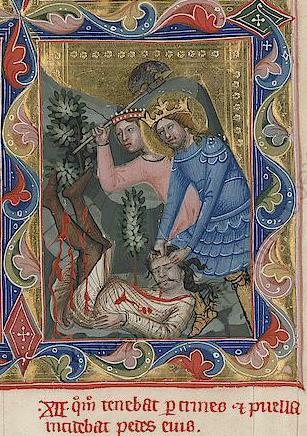 The quality of its execution and its sheer size indicate that the manuscript must have been a royal commission, and its iconography – rich in Hungarian and Angevin saints – suggests it was created for the court of the Hungarian Angevin kings. According to earlier opinions, the codex could have been ordered by Charles I, king of Hungary (1307-1342), for his son, Andrew educated in Naples, or for his own library. This somewhat romantic notion, based on the naive theory that medieval picture-books were meant for children, has recently been called into question (see the study of Béla Zsolt Szakács: "The Holy Father and the Devils, or Could the Hungarian Angevin Legendary Have Been Ordered for a Pope?," In: ... The Man of Many Devices, Who Wandered Full Many Ways ... Festschrift in Honor of János M. Bak. Ed. by Balázs Nagy and Marcell Sebők. Budapest: CEU Press, 1999, 52-60. ), but no new proposal has yet been generally accepted. 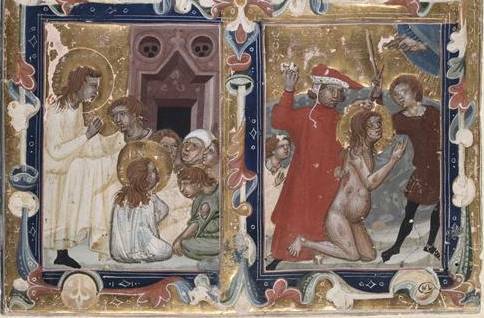 With regards to its style, the research of Meta Harrsen, Robert Gibbs and others have clarified its connections with the Nekcsei-Bible (on which you can read my recent study, which I made available through Academia.edu), and thus with the circle of the Master of 1328. 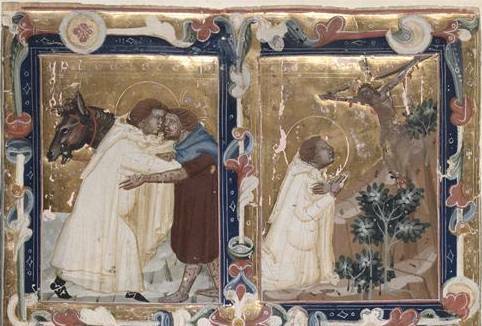 However, Tuscan, South-Italian and unidentified features are also present in the manuscript's style, and its iconography shows deep Hungarian influence; thus, the place of its creation might have been in Hungary. The dating of the codex, based on these hypotheses and stylistic examination, can be put between 1328 and 1345. The leaf in the Louvre was first published in detail by Gyöngyi Török ("Problems of the Hungarian Angevin Legendary: a new folio in the Louvre," In: Arte cristiana vol. 89 (2001), 417-426), who also wrote on it in the new catalogue. A Hungarian version of her study is available here. Those with JSTOR access can read another study by Gyöngyi Török ("Neue Folii aus dem 'Ungarischen Anjou-Legendarium,'" In: Zeitschrift für Kunstgeschichte vol. 55. (1992), 565-577). 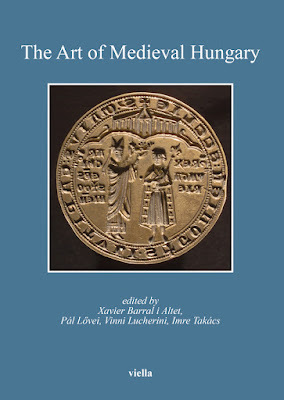 Another study on a leaf at Berkeley is also available online (Julia Bader - George Starr: "A Saint in the Family: A Leaf of the "Hungarian Anjou Legendary" at Berkeley," In: Hungarian Studies vol. 2 (1986), 3-12). Pages from the manuscript were last on display at The Morgan Library and Museum, in 2009. 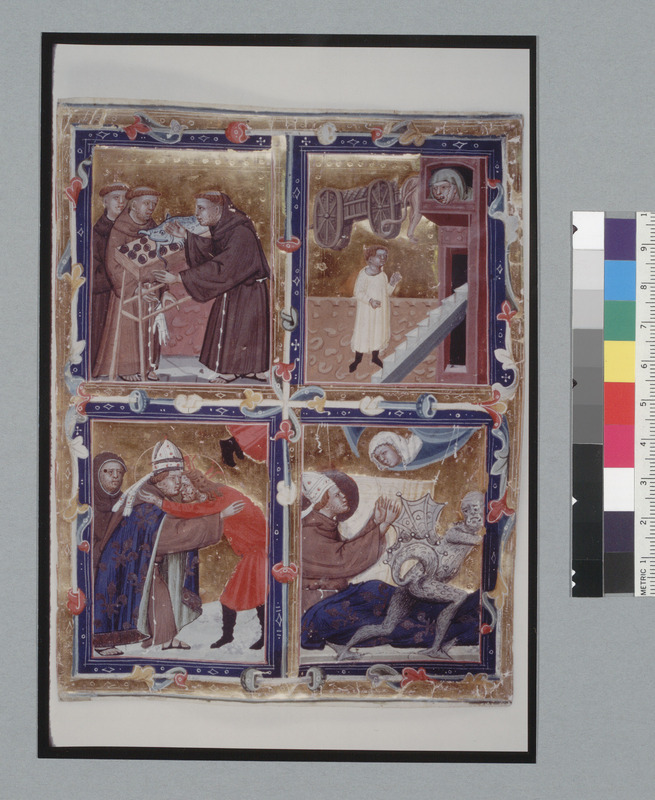 Another leaf from the legend of St. Francis is at the Metropolitan Museum of New York.